Welcome back to the “I have a new car” blog! Getting through this coming winter was looking like a worrying time. As luck would have it, one of my Mother’s friends happened to mention that she rarely drives and was looking to get rid of her car. Knowing my situation, Mum asked her to consider us if she did decide to sell. Long story short: I (with a little help from Dad) bought the car! She has a reflection of the Sydney Opera House in the rear wing! 1300cc engine is notably more power than anything I’ve driven before! I have figured where most of the important controls are, although I am settling into the “New Car Standard-Signalling Procedure”. The correct action when a new car approaches a junction is to switch on the windscreen wipers, and then indicate in both directions while changing radio stations. But you knew that. I still don’t know how to get to the engine, but I hope that I never have to! My sister-in-law has had two KAs, and given me some suggestions, but she is of a similar “ring the RAC” mind as me. It’s a little early to comment on fuel consumption, but I feel that she may be a little thirsty. I’m still impressed at modern mileage figures, though. My initial estimate is approximately 45MPG. I hope to be able to get that up to 50, once I’m more familiar with the clutch and gears, and no longer massively over-revving on manoeuvring. Li’l Suzie (also known as The Car of Theseus) is being taken away later this week. While I am sad that our 4 year relationship is over, I know that she served me as well as she could. She is red. This part is not so puzzling. KA ‘ren = Karen. If you’ve got a better name for a KA, please let me know! 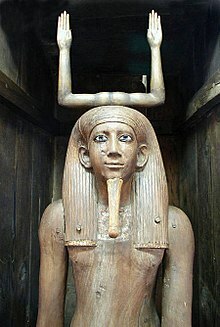 Pharaoh Ka reigned Egypt circa 3200BC. His name means “soul”, as signified by the “raised arms” motif. I don’t see my general attitude towards cars changing; keep them running until they are no longer economically viable. How much will it cost to get her through the next MOT? Hopefully, Red ‘ren will last a good few years before needing any major work, at which point, I will have to consider my options. *Road Tax: Colloquial term for emissions-based Vehicle Excise Duty, a tax levied on all motor vehicles that use the public roads. The funds raised go in to the general Coffers, and are not ring-fenced for any particular purpose. This entry was posted in Around The World, Car, History and tagged car, stallion on November 22, 2018 by The Crystal Wizard. Eleven years and 5 days ago, I spent my insurance money from my last car being written off on the deposit for a new car. And I mean a NEW car. Brand New. Straight out of the showroom. 7 miles on the clock, It was a bit of an extravagance, but I felt I could afford it, if I was careful. I’m not sure what type of car you think The Crystal Wizard would choose, but it wasn’t a macho diesel-head’s choice! You may say I was old before my time, or just think I fell for “teh squeeee!” (for it was indeed cute!). I like to think I got a good deal on a cheap, easy to drive, low maintenance transport vehicle. £30/year Vehicle Excise Duty (‘Road Tax’ to the non-pedants amongst us), 50-60 mpg. Enough cargo capacity for my weekly shopping, or a customer’s PC in for repair*. 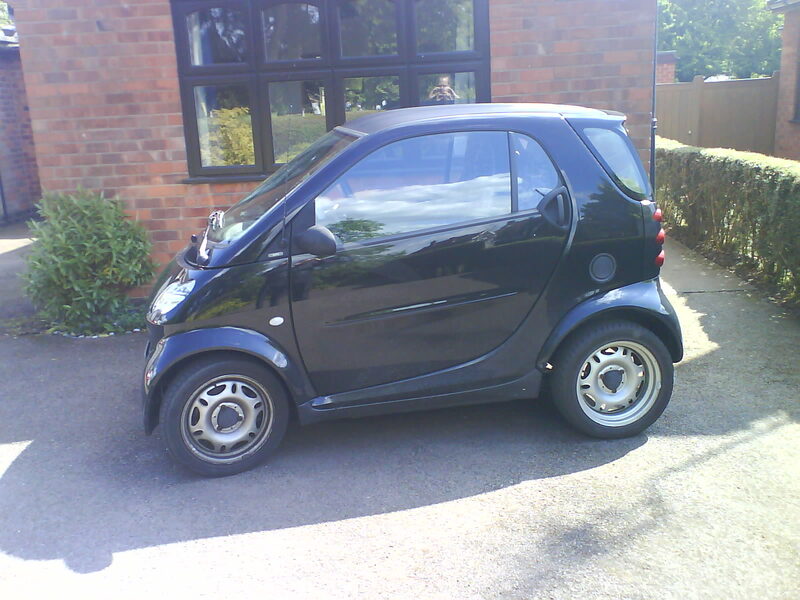 My Old Smart Car, in better days. Over the years, we went to so many places together. Avebury. Bristol. Aberystwyth. Loughborough. We explored almost all of Leicestershire; the main routes, the side roads, the dirt tracks and gated roads. Village and towns, cities and farms. It seemed like a romance that would never end. But, alas, that is not the way of things. Problems started to develop in the automatic gearbox, that had served me so well. More than once, i was stuck, blocking traffic in rush-hour. Not only did I have to stand at the side of the road, giving the queuing drivers apologetic looks as I waited for the RAC to arrive and carry me and my car to the garage, but I also had to endure the glances from said drivers. Delayed in their trip home, no doubt missing their loved ones, or wondering what shade of burnt their tea would be, their looks of pity and understanding were almost unbearable! Anger and frustration I could have coped with. Given as good as I got, and more. One lady, slowly crawling past, trapped in the heat of her steel cage, with a daunting motorway journey ahead, stopped to offer me a bottle of water. Another time, two youngsters, who I had taken for ruffians or ne’er-do-wells, helped me to push the car out of the main lane, and onto the pavement. This was also the time that, upon calling the local police to alert them to the blocked road (city centre, 5pm, main thoroughfare), the young lady on the phone chortled at my predicament and, with good cheer, said “You won’t be popular, either with the drivers, or the patrol car I’m sending! Good Luck!”. Eventually, I had enough. It didn’t help that, while the Car was sat near my house, gearbox awaiting some TLC, some local thug smashed the rear window in. And stole NOTHING! There was a portable DVD Drive that cost me £70, that would have fetched £20 down the pub. A PSU that could have got £5. My emergency box would have provided them some mild amusement, if nothing else (tire-weld, air-compressor, bag of mints, transparent poncho). But no. They brought the police round to my house at 5 AM because they took nothing. Gits. So, one last repair, I’m thinking. One last chance. I got the call a couple of days later. She’s ready to roll. Taking the bus to Anstey (a risky prospect at the best of times! ), I collected my car, and set off to my next job. Out onto the A46, and open up the engine. Get some revs going … and nothing. No power. I managed to limp her home, but this was to be her last trip. The gearbox is still unreliable, the pistons are leaking, and I don’t know how long the cooling system will last. So, the Car has sat on my parents’ drive, awaiting the end. I already had a replacement (Silver Stallion), so it was just a case of finding someone who would take her off my hands, preferably paying me for it, rather than me having to pay them! And that day was today. A car transporter, already laden with several insurance-job vehicles rolled into my parents’ small village and blocked the road for half an hour while we sorted out paperwork. I couldn’t bring myself to watch it drive away, and scurried inside, blaming my watering eyes and sniffling nose on the roaring cold I’ve had for the past two days. Goodbye, Ebony Goddess. I’ll never forget you. *max load in practice: One (tall) passenger and 5x 17" CRT monitors. This entry was posted in Car and tagged car, nostalgia, smart, stallion on March 6, 2014 by The Crystal Wizard. Yes, I have now driven just over a thousand miles in the SIlver Stallion! MPG is not as good, but I think I’m improving it. Getting up through the gears quicker is helping. I still have to drive a lot of small roads and housing estates, which doesn’t help, and the fact that I stop as soon as the engine is warmed up, and have to leave it just long enough to cool down before driving off again is always going to put more wear and tear on it. I’ve tested it out in the rain, and at night. I know where the lights are, and how to switch full-beam on and off! Soon, I’ll have to find out how it handles in the ice! A minor niggle is that the driver-side sun-shade is loose! If I try to keep the sun out of my eyes, it gradually slips, and I can’t see the road! So I’m finding ways around this until I figure a way to tighten up the hinges. So, overall, I’m reasonably happy with it, and soon will be driving it like a veteran! This entry was posted in Car and tagged car, stallion on December 20, 2013 by The Crystal Wizard. The Continuing Adventures of The SIlver Stallion! Not that I want this to turn into a “Me and my car” blog, but I haven’t changed cars in over ten years, and this one is quite different. Just a couple of updates, and I’ll get back to Art! Honestly! We’ve done 98 miles together now, so I’m getting used to having to change gears manually, and although I’m still over-revving, its not so bad. Steering is the main thing I have to watch now – such a long nose to take care of! And it swings around! I still worry that it is so wide, it won’t fit into gaps, only to realise I could fit a bus through! I think the best thing is not having to worry about getting stuck in traffic! the SMART was getting very unreliable in such situations, so I can use the busy roads again, rather than trying to take massive detours! I only put the windscreen wipers on, instead of indicators, once today! A major improvement! And I’ve found out how to change radio stations! Next, how to add stations to the pre-set buttons, rather than just searching for the next one. After that, I’ll look at investing in a mp3-to-tape gadget. And maybe an mp3 player to plug into it! So, I’ve driven in the rain, at night (lit areas! not tried full-beams yet), sunny and evening (staring into setting sun!). I’m getting to grips with the controls, and the storage areas (I have a glove compartment! Not that I have any gloves). I haven’t left it unlocked yet (no beepy-key! I have to use the stone-age “put-the-key-in-the-lock-and-turn” method! I feel so Hipster Retro! “Of course, i was using that type of lock before it was trendy”). Once I’ve sorted out the less-than-pristine bodywork (rust? noo, that’s not rust, thats, erm, designer fashion accessories! Its supposed to look like that! ), I might get some pics. Probably nothing that will make it to AutoPoster, but something to show off its handsome curves! Want to hear more about The Silver Stallion? Stay tuned! This entry was posted in Behind The Scenes, Car and tagged car, stallion, traffic, update on November 7, 2013 by The Crystal Wizard. Rise of The Silver Stallion! It was a great car, while it lasted. Cheap on petrol and road tax, park anywhere, turn round on a sixpence. I could even carry a reasonable amount (I once fitted 5 old-style computer monitors, and a passenger!). But it had been playing up for the past year or so, and I don’t fancy being stuck in rush-hour traffic, blocking lanes, again! So, with these latest problems, it was time for a change. As luck would have it, a friend-of-a-friend was getting rid of a Mitsubishi Colt. It was a good price, and I needed a car, so jumped at the chance! I’ve spent this afternoon getting a SORN declaration for the SMART, and cancelling its insurance, while I decide what to do with it. If you know anyone who wants it for spares/repairs, let me know! Then, insuring the Colt. 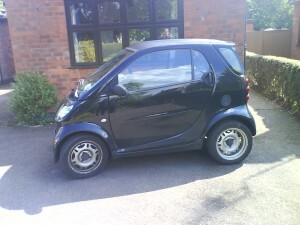 After some haggling, and much hammering at comparison sites, I eventually managed to get a cheaper deal than the SMART. The SMART was emptied of the usual bits and bobs that build up – petrol can, tyre-weld, travel-blanket, notepads and pens, music CDs, red warning triangle, fluffy dice, and other assorted items. Some will be transferred to the Colt, while others will be retired/trashed. A quick trip to the local petrol station to fill it up turned into a longer trip, as the local was closed! Apparently its being turned into an M&S! This gave me more of a chance to get used to the manual gearbox, and give my clutch-foot a good workout! The indicators are on the ‘wrong’ side, and I kept flicking the windscreen wipers on instead! Fearful of stalling, I’ll be over-revving it for a while yet, and it seems almost twice as wide as I’m used to! But teething-troubles aside, it looks like it should do the job. So, farewell, Little Black Chariot; you have served me faithfully, but it is time to make way for another. This entry was posted in Behind The Scenes, Car and tagged car, colt, new, old, replacement, smart, stallion on November 5, 2013 by The Crystal Wizard.